Just dropping in to share a quick recipe. A vegan recipe, actually. I’ve had a large spaghetti squash hanging out on my counter for the past . . . three weeks? Month? But when I finally got around to slamming it into the microwave, scraping it down and dousing it with spices, it still performed beautifully. That’s it. Enjoy! This warmly-spiced, simple squash dish is what you want to accompany a fall weeknight dinner. Carefully pierce the squash several times with a sharp knife to prevent the squash from bursting in the microwave. Microwave on high for 16 minutes, turning halfway through. Slice the squash open lengthwise and allow to cool enough to handle. Using a fork, lift out the seeds and discard. Then scrape out the insides into a medium mixing bowl. Mash and shred until the strands are separated. 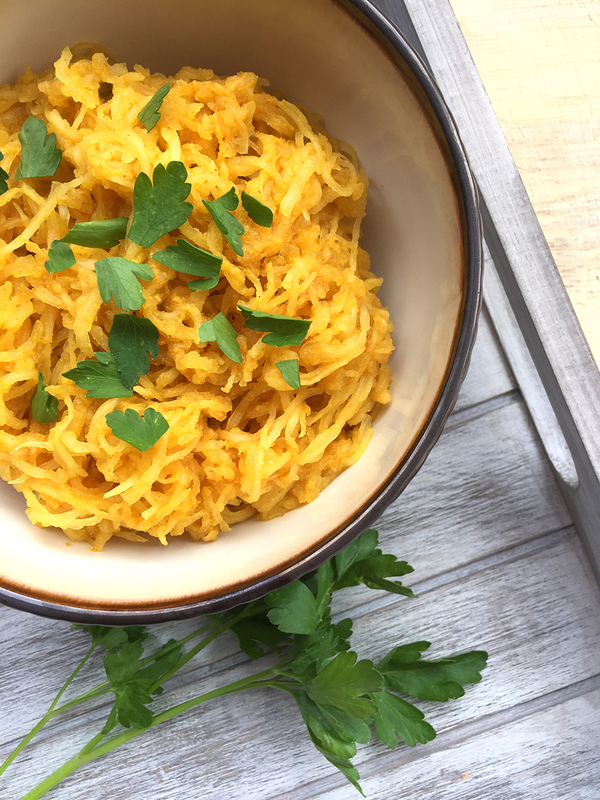 Stir the coconut oil, coriander, cumin, salt, turmeric and cayenne into the spaghetti squash. Combine thoroughly, then serve warm and topped with parsley leaves. I can’t wait to try this. Weird that the first commenter couldn’t handle 1/2 tsp of turmeric to a whole spaghetti squash. Turmeric is amazing and I’m always looking for different ways to get it into my diet! Right now, I take Gaia Herbs Turmeric capsules with black pepper. They have made me feel great! Some people just really don’t like turmeric, is my guess. I’ll have to check out those capsules! Hey Rachel! Just wanted to let you know I featured this recipe in my “50 Paleo Fall Squash Recipes Roundup” I posted this weekend. Looks amazing!! I couldn’t resist sharing it 🙂 Thanks for the inspiration, keep the kickass recipes coming! Awesome! Pinned, tweeted and shared to Facebook!